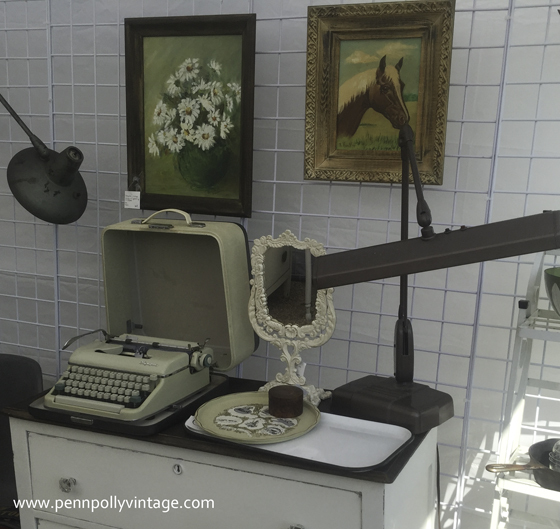 Lucketts Spring Market is an institution and I was soooo excited for Penn Polly Vintage to be making its inaugural appearance. I had been hunting down unique “just for Lucketts” goodies for some time. Lucketts Spring Market is famous for its cottage chic furniture. 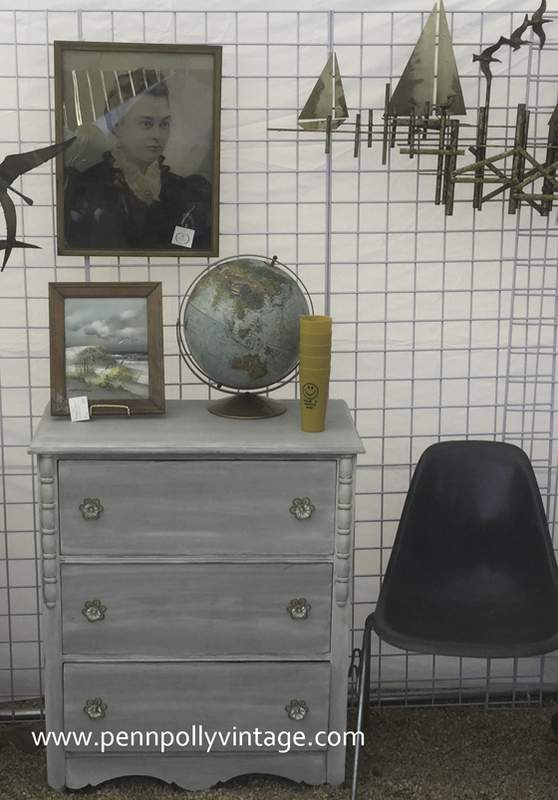 I was a little concerned about how my eclectic mix of mid century, industrial, kitsch and some traditional antiques would fair. I shouldn’t have worried. 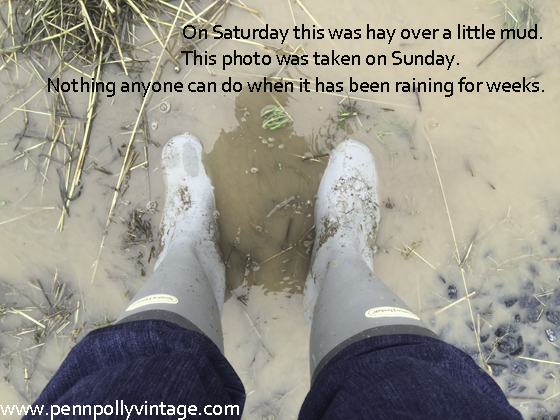 Penn Polly Vintage did fine, even in the face of way too much water. Rain, that is. Actually torrents of rain on top of a previous month of unending wet weather. The continual sogginess had me convinced I was living in the Pacific Northwest and left me struggling to get ready for the market. Forget maintaining the blog. Forget online selling. 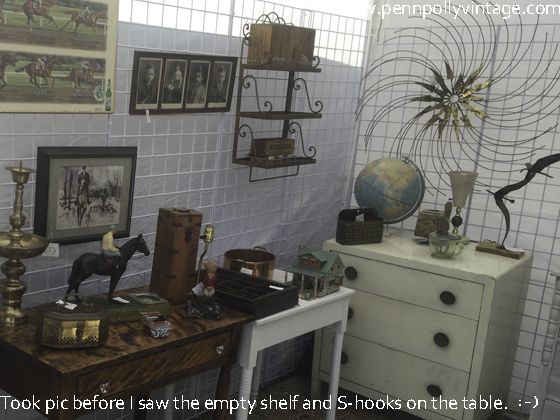 Forget carefully tending my new antique booth. All I seemed to do was start and stop Luckettsesque furniture projects that required an elusive low humidity. the top of his truck’s ladder rack just in case of an extreme tent flooding event (thank you Christopher for the pallets!). Behind the truck was a big, borrowed covered trailer (thank you Shannon!) with the furniture and tent stuff. Behind that was me, or the Big Boss, as the roadie likes to refer to me, with the smalls packed into my wagon and a cargo carrier on top that may be larger than the vehicle. An exaggeration on the last one, but we were stylin unique. Setting up for this type of show is not a quick enterprise, but after several hours of hard labor we had a canopy with metal walls and a sizable bunch of goodies pouring out of it. I was ready! Friday dawned as the early VIP day. It was sunny and even getting a little hot. Excellent shopping weather! We kept hitting our phone weather apps and by the end of Friday it became apparent that the rain would be returning on Saturday. Arghh. There was no choice other than to cram what was left under the 10 x 10 tent. All of the furniture went up on blocks to protect it. There was absolutely no way my goods were getting wet. My erstwhile roadie set up his circular saw in the vendor parking field to cut up the 2 x 6s. (I’m telling you, shows are crazy for vendors). The roadie and I just met so many nice people. They came from up and down the East coast from Williamsburg VA to PA to New Jersey to North Carolina. I also made a couple of new vendor friends and saw some of the folks I already knew. 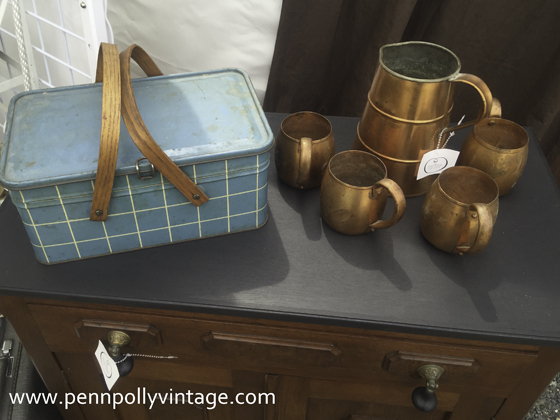 All of them had loads of interesting vintage and antique inventory! Wish Saturday had been sunny and the normal truly huge crowds had come out, but if it’s going to rain, it’s going to rain. Not much you can do. So by late Saturday afternoon, we’re standing there in the rain at Lucketts and Mr. Luxurious Beard is telling me that his new Costco waterproof jacket is no longer shedding water. We were watching a small water tanker repeatedly spraying the mud off of Lucketts Road (from cars coming out of the field parking). We heard vehicles were being towed out. We could see what was coming. So, I understood when the last day of the event was cancelled. Was I bummed? You bet. It was also the correct decision. We came back on Sunday to pack up hoping that the rain would have stopped by then. Hah! While my tent and stuff remained dry everything else was like a swamp. We’re talking inches of standing muddy water. The Lucketts Spring Market folks advised vendors not to go off the gravel when packing up. One didn’t listen and almost didn’t make it out. Spinning wheels throwing mud five feet in the air. Sigh. Then there was the guy sinking in above his ankles in those ventilated rubber garden clogs. He made a little squealing noise with every step. Some couple behind us were bickering in the usual show setup/breakdown way that you always see. My view, is its better to remain positive. We just kept on going. The roadie helped our very nice solo neighbor load the big stuff on his rental truck and received help in return. It was a welcome sight when we we pulled our muddy selves up to the rear of the antique mall and the back door opened. A head poked out, and I was told “we’ll unlock the upstairs for you”. Like coming home. Lugging stuff up a lonnnggg staircase with a 90 degree turn almost killed us after the multi-day marathon we had just been through. But by closing time my stuff was in the space. Not in nicely, but in. The question is would I do the Lucketts Spring Market again? Absolutely. The Lucketts staff were great! The roadie with the luxurious beard said that everyone exceeded his expectations for Southern hospitality, and that, my friends, is hard to do. From the twinkly-eyed Henry on the gate (definitely the roadie’s kindred spirit) to Casey who helped me with a map issue (thank you!!!!! ), it was a great experience as a vendor. When one of the pink shirt guys borrowed the bearded one’s dolly to deliver some other vendors’ furniture, he returned with another pink shirter and both thanked the roadie profusely. Basically, the Lucketts staff were organized. They were nice. They maintained their cool even when the big guy upstairs was throwing down an historic period of weather on Northern Virginia. 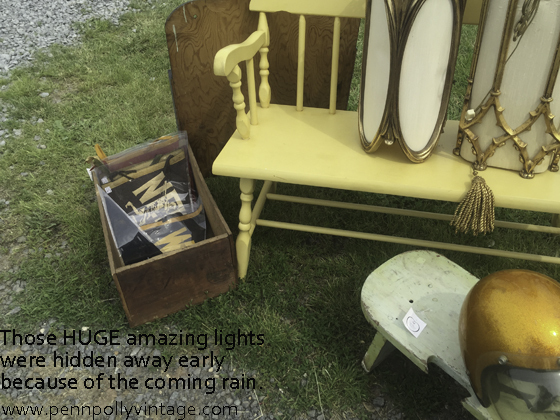 I met wonderful customers, sold things, and viewed inspirationally cool vintage. Oh and I had the best doughnut I have ever eaten from the red doughnut truck. What more could you want? Well, maybe dryer Lucketts Spring Market weather next year? And before I go, a HUGE thank you to the roadie with the luxurious beard. I wouldn’t have made it through the rain so gracefully without his myriad skills, can do approach, and humor. Penn Polly Vintage signing off. Just happened upon your blog : ) and I have to say that you have a fabulous outlook on life. Now if everyone had your positive attitude, what a great world this would be! Hi Cathy and welcome! Thanks so much!!! That is such a nice thing to say!